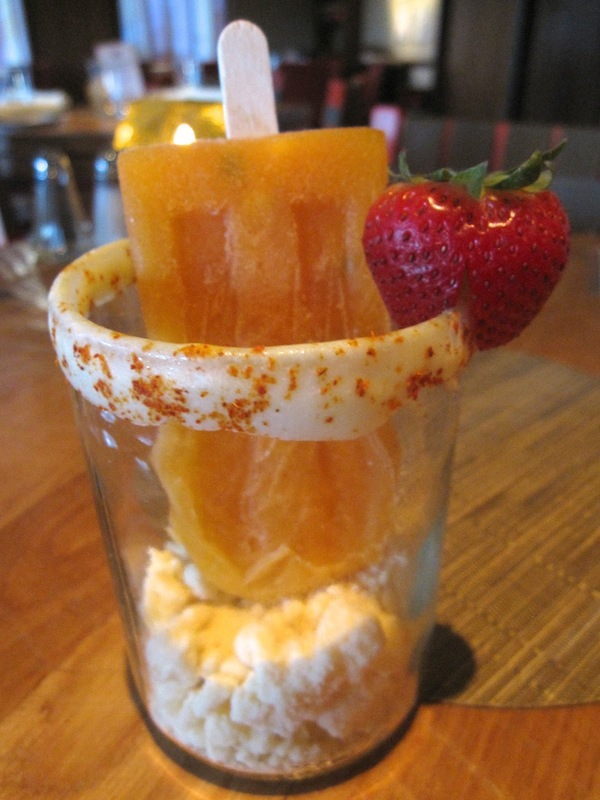 Dining Out: Ice Cream Festival At Rosa Mexicano | Pop.Bop.Shop. It's no secret, I am obsessed with Rosa Mexicano. I first fell in love with their location in Union Square in New York, then skipped to their opening in Mary Brickell Village in Miami and of course, squealed with delight when I learned they were coming to Boston. 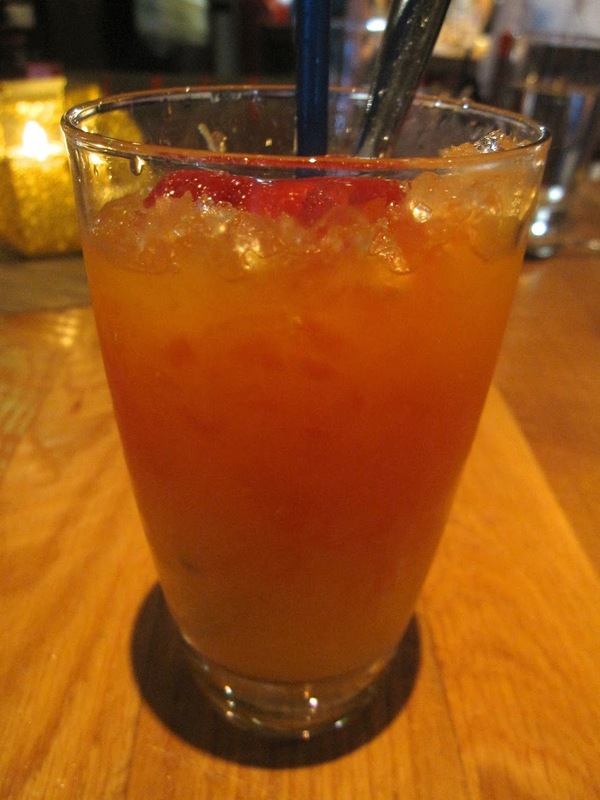 You may remember my visit to their Seaport location last June, my autumnal feast at their Fall Harvest Dinner, my sweet and savory courses at their Desuyano Mexicano (breakfast) or most recently, my visit on Cinco de Mayo. Imagine my sheer joy when they invited me to sample their newest menu - the Rosa Mexicano Ice Cream Festival. Molly, Rosa and ice cream? Could any three things be more meant for each other? 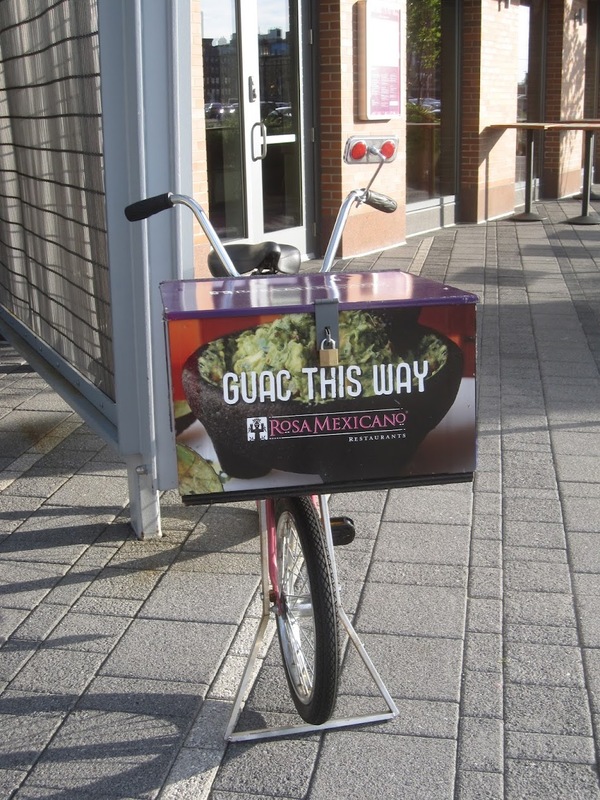 I walked down to the Seaport from work and smiled upon noticing Rosa's delivery bike parked out front. It has a sign on the cooler that reads, "Guac this way." Don't mind if I do. 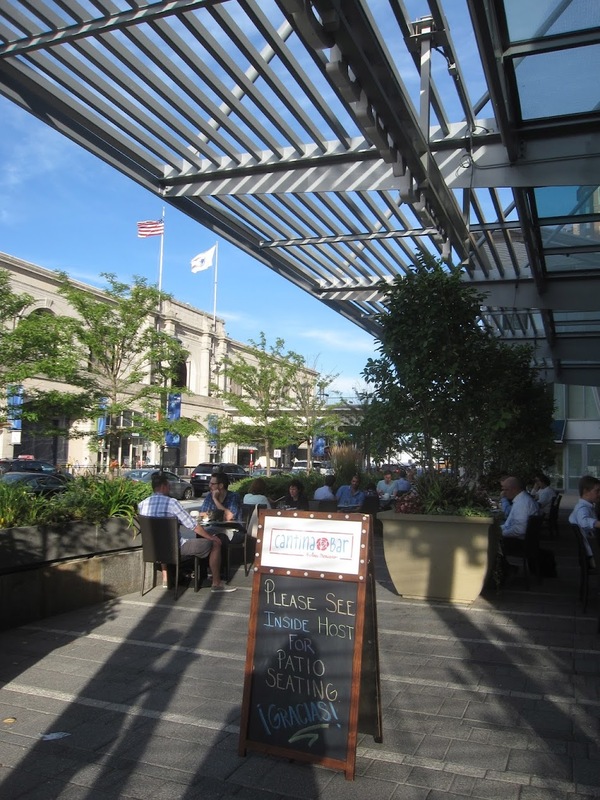 This particular night it was gorgeous outside and the Rosa patio was buzzing! I went with a friend and when we were seated our fantastic waiter (who remembered me from my last visit) delivered us the special Ice Cream Festival menu. To start, we sampled each of the two Ice Cream Festival drinks. The first was called the verano (Spanish for summer). The drink is tequila, blood orange sorbet, agave nectar, fresh blueberries, mint and lime. When they make the drink, they scoop the sorbet right into the cocktail shaker and mix it up. The garnish of blueberries is actually frozen! The first few sips of the verano were all alcohol. That drink is strong! 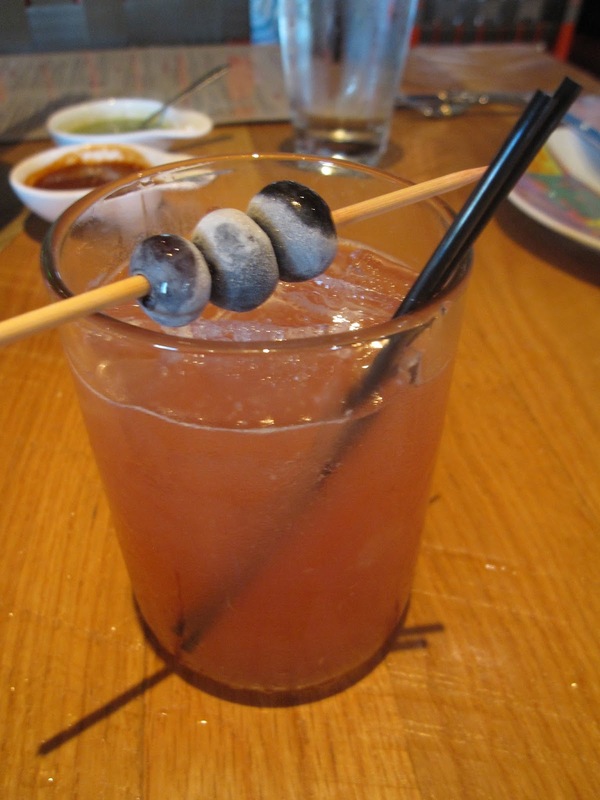 We did love the touch of the frozen blueberries and if you like tequila, this drink is definitely a great summer pick. 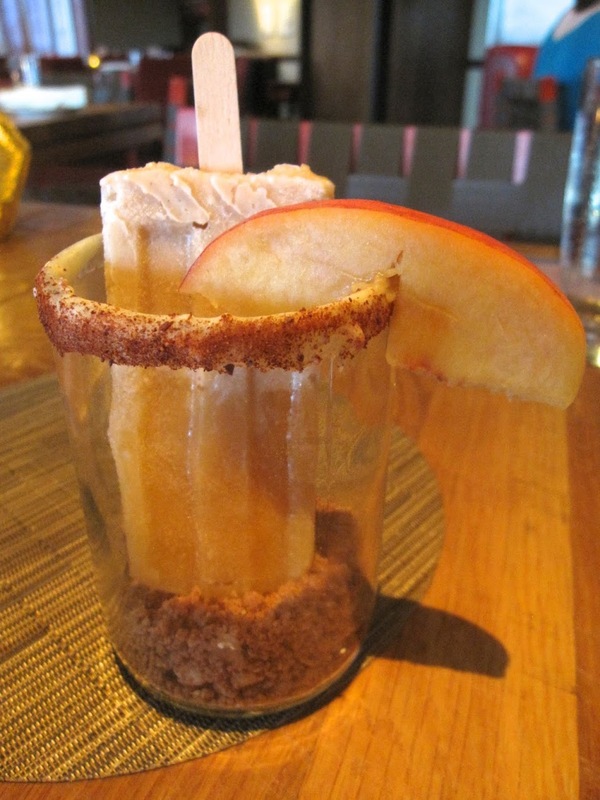 Next up was the chavela especial, which was Model Especial served with a frozen paleta (popsicle) of sangrita. The popsicle is made with tomato, red pepper, cucumber, celery, habanero, fresh orange and lime. The glass is also rimmed with chipotle morita, chile de arbol and salt, which our server warned me is extra hot. I am obsessed with the presentation of this drink! 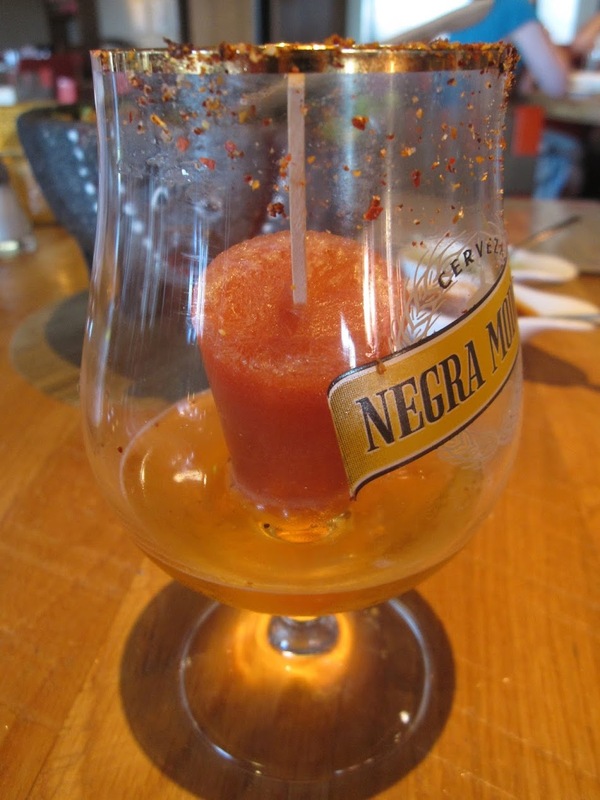 I love the sangrita popsicle as a way to stir more flavor into your beer. 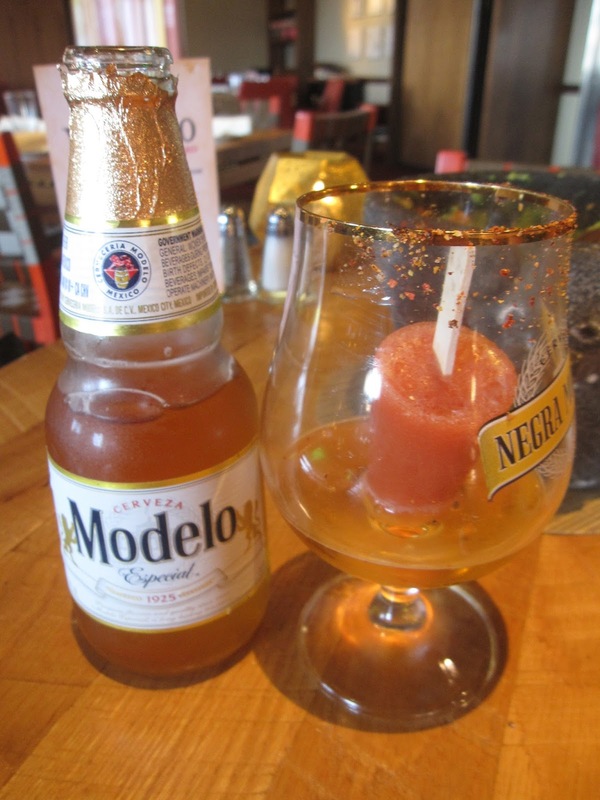 To be honest, when I ordered the drink, I didn't know Modelo Especial was a beer. I thought the drink would have some type of tequila. I don't normally drink beer, but I was really into this cool, creative combination. It was so fun to stir up my drink with a popsicle! It also tasted better and better as the popsicle melted. In case you are wondering, I did take the popsicle out and try it by itself, but I don't recommend that! It was way too strong on its own. You've been forewarned! Though we were invited to sample the Ice Cream Festival menu, my dinner date had never been to Rosa before so I insisted she try some of the savory items as well, starting with the signature guacamole. 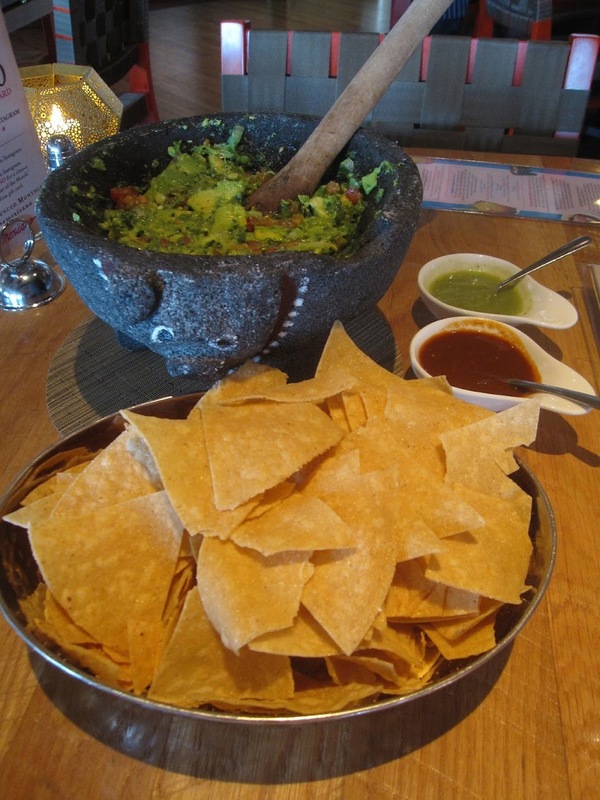 Rosa prepares all their guac table side with the absolute freshest ingredients. As always, the guacamole is served with tortilla chips and the house's two salsas. We devoured the entire bowl in about 90 seconds. For dinner, my friend went with the fish tacos. She said, "These were the perfect ratio of fish to cabbage. The fish was crispy on the outside and juicy on the inside. The sauce over the fish was incredible and if you get a bite with all the components, it's heaven." I decided to have the cheese enchiladas, which is one of my favorite dishes at Rosa. Though it looks like a large portion, it's actually very light and you can eat the whole plate and still have room for more. On the side we shared the rice and beans, which I've said before, are excellent. Sometimes I ignore side dishes because they are underwhelming, but not here. Every component, whether it's the star of the dish or not, is well executed. When it was time for dessert we were giddy with excitement. 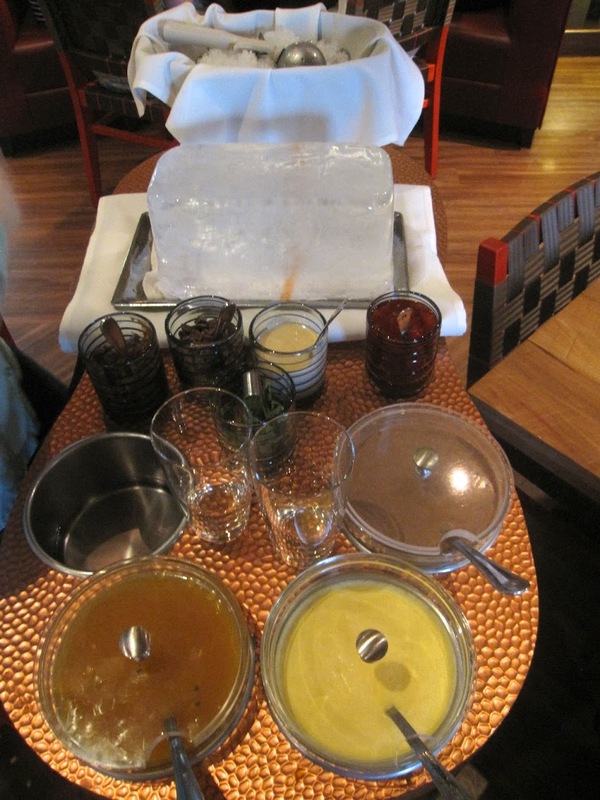 The first specialty to come through the kitchen doors was the trio of paletas (popsicles). 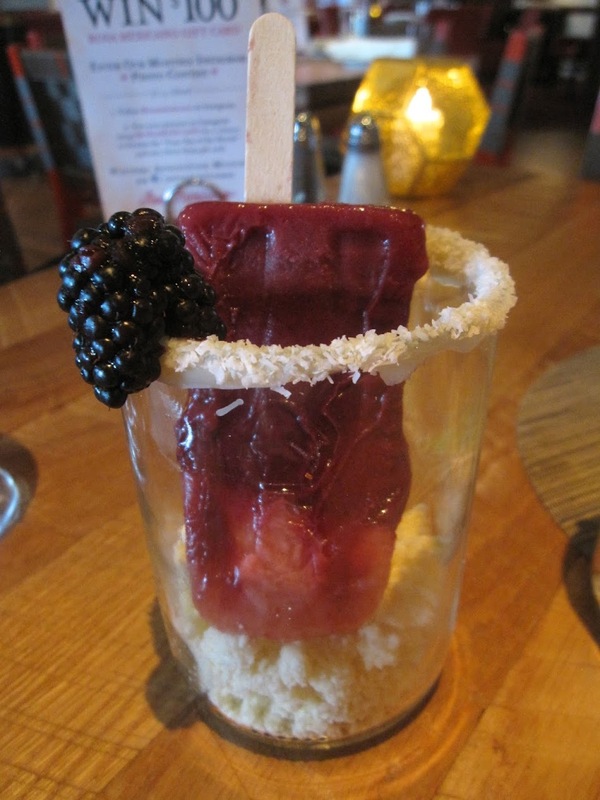 Each popsicle was served in a glass rimmed with white chocolate. At the bottom of each glass there was a crumble (more on that in a minute), that the manager told us is like the equivalent of sprinkles. You take a bite of popsicle, then you dip it back into the crumble. This way you get the crunchy topping with every bite. How gorgeous is this presentation? The first popsicle was guava, chile de arbol and huckleberry served over a coconut milk crumble and garnished with a fresh blackberry. This was my favorite of all three paletas. I loved the rich, saturated flavor of the hucklberry combined with the kick of the chile de arbol. Next was the papaya and passion fruit paleta served over a strawberry milk crumble and garnished with one juicy, red strawberry. Personally, I wasn't into this tropical, citrus flavor. I took one bite and said to my date, "This tastes like body wash." For me, the flavor was way too fruity and reminded me of a scent from The Body Shop. The final paleta was arroz con leche (like rice pudding) with peach, leaning in a cinnamon crumble and finished with a slice of fresh peach. The manager told us to make the popsicle, they actual puree the rice pudding to make it a more digestible consistency before freezing it. This popsicle is actually two separate components frozen into one and when you lift it from the glass you can see the rice half and the peach half. My favorite part of this paleta was actually the cinnamon crumble, which tasted like Cinnamon Toast Crunch cereal! After the paletas, the manager rolled over behind a cart. I was stunned because I thought Rosa only used carts for the guacamole, but this cart is even better - it's for snow cones. Then right there, next to our table, she shaved the giant ice block by hand to make us Mexican snow cones. We had a choice of three flavors: mocha caramel horchata (like ice coffee), orange creamsicle or passion fruit and lime. 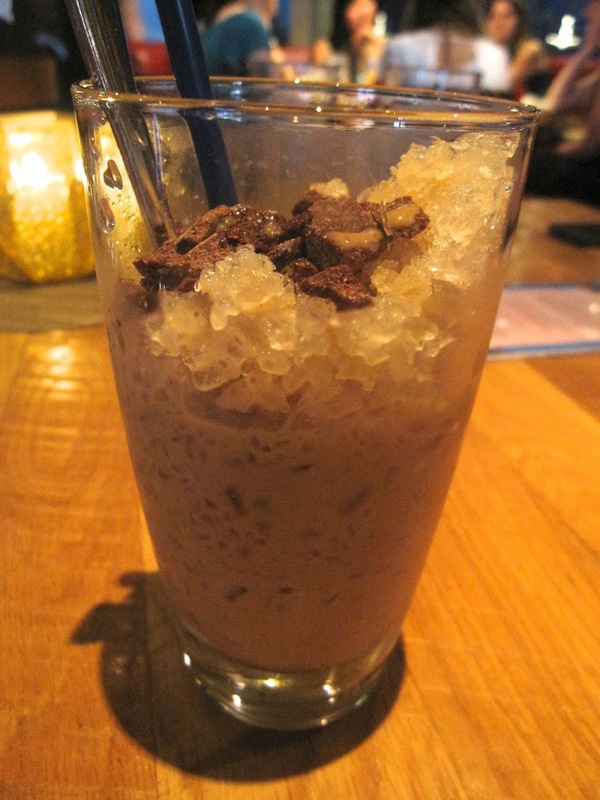 Surprise, surprise, I went with the mocha caramel horchata and I selected Mexican chocolate as my topping. The snow cone was created by the manager shaving one layer of ice and spooning one layer of horchata, then repeating this three times, almost like a parfait. As a result, each and every bite has the exact same amount of delicious flavor. This tasted like the ultimate frappuccino. I would like to start my morning every single day with this drink. Rosa crew, perhaps I can swing by on the walk into work each morning? My dinner date went for the passion fruit and lime snow cone, topped with strawberry compote. She was nice enough to let me have a few sips and I have to say, I liked the passion fruit flavor much better in this form, than in the paleta. This was actually quite refreshing. Here is our duos of snow cones! We were given both spoons and straws to make sure we could enjoy every last drop. Next we were treated to the ice cream stuffed churros. If those three words don't make you want to drool, you don't deserve to be reading this. I don't know a single person who doesn't love churros. The idea of taking something so beloved and elevating it by adding my most favorite food in the world? Mind = blown. The dessert is served as trio - three churros, each stuffed with a different flavor of ice cream and served over a different type of crumble (are you seeing the crumble theme here?). Each churro is then topped expertly with a single mint leaf. The first churro was sweet cream ice cream with shaved Mexican chocolate and cajeta (like caramel), swirl. This was hands down our favorite. When you cut into the churros, the ice cream spills out, combining with the crumble and the chocolate syrup to form a bite that tastes like the last few soupy bites of an ice cream sundae. Yes, please! The center churro had strawberry rose ice cream. I was not a fan of this at all. The ice cream tasted way too floral. I only took one bite. When we cut it, the manager said, "Don't you think it looks like how your heart feels after you open it?" The final churro was wrapped around plantain and peanut butter ice cream. I am not a peanut butter fan, so this one was doomed from the start, but I will say, it tasted like banana bread batter and I find that taste very comforting. If you like the taste of banana bread, you'll really enjoy this one. At this point, we were so full we considered unbuttoning our pants. We turned to each other and said, "I really hope that was the last one, I don't know if I can eat any more." Then our servers returned with a tray and explained they were going to compose the guacamole sundae. As I already mentioned, Rosa is known for their table side guacamole. Well, this dish is a play on that house specialty, but gone sweet. The tray is covered with ingredients meant to mimic the guacamole ingredients - avocado ice cream for the avocado, raspberry for the tomatoes, white chocolate for the onions, mint for the cilantro, sweet sugary chips for the tortilla chips and so on. My gut was telling me this was going to be disgusting, but in the biggest shock of the whole evening (even more than a popsicle in my beer I didn't even mean to order) was that this dessert was the best of the night, hands down. Though your rational mind is telling you that avocado ice cream cannot possibly be good, it is! The combination of the smooth, creamy ice cream with the bursts of fresh raspberry and the decadent white chocolate chips is pure nirvana. To keep the sundae cold, Rosa actually freezes all the bowls they serve it in. These guys sleep in the freezer! The manager recommended we enjoy the sundae my scooping bites onto the sweet chips. She was right, that was delicious and added the crunch you might normally get from an ice cream cone. If you wanted to eat the sugar chips on their own, you could also dip them into the chocolate or strawberry sauce, meant to mirror the two Rosa house salsas. As we worked our way through the guacamole sundae, we kept asking each other, "Why is this so good?" It's impossible to explain, but all of these ingredients together are incredible. Now I'll be going to Rosa and having to decide which version of the guacamole do I want more - the sweet or the savory? Lucky for all of you, the Rosa Mexicano Ice Cream Festival menu is available now through Sunday August 25th. You can indulge in every single one of these confections for the next three weeks! Which dessert looks best to you? Molly! I've been waiting for this post ever since I saw your pics on IG! 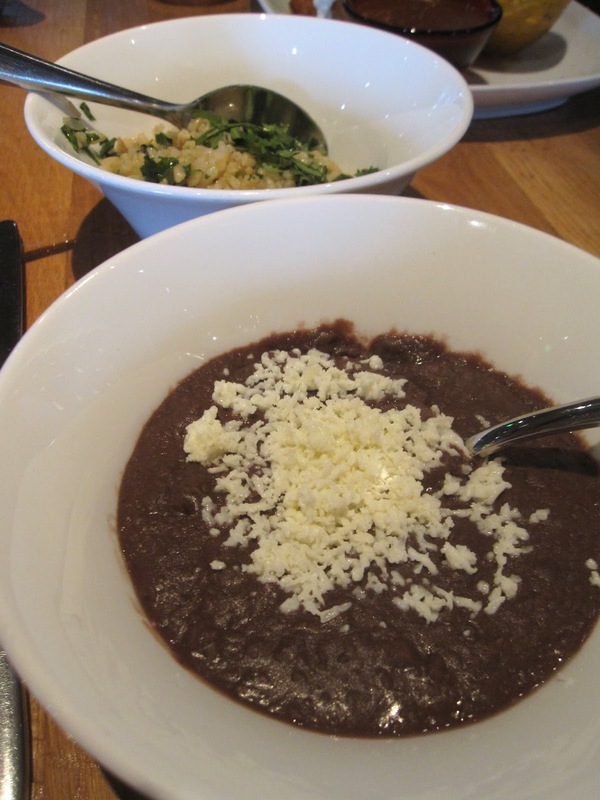 I can't wait to try Rosa Mexicano the next time I'm in town! That guac sundae looks incredible... and the popsicles? Oh my! It's no secret, I love Rosa Mexicano. Starting this Thursday, May 1st, the restaurant will kick off a celebration appropriately called, the Five Days of Cinco de Mayo at Rosa Mexicano. From May 1st - May 5th the restaurant will offer a $35 prix fixe menu, a DJ and a mariachi band. During this five day celebration, you can enjoy Rosa classics like pitchers of margaritas, table side guacamole (the undisputed best guac on the planet), nachos, tacos, flautas, tortilla soup, enchiladas, churros and more. Those who read the blog regularly know that I rarely write about anything more than once. Whether it's a restaurant, a shopping destination, a museum or a special event, I'm generally a one and done kind of girl. It's no secret that I love Rosa Mexicano. From my very first visit in Union Square in New York City, I was instantly a fan. When Rosa opened here in Boston last spring I was couldn't wait to go. You may remember my feast that first trip or my four course meal during the Rosa Fall Harvest Dinner this past November.